The kitchen is one of the most important parts of your home and is typically one of the busiest as well. So it is important to keep it functioning, properly working as well as possible during the remodel project and afterwards when it’s complete. So it is important to not only keep your kitchen looking nice, but guarantee it is up to date enough to handle all the needs of a modern family and lifestyle. 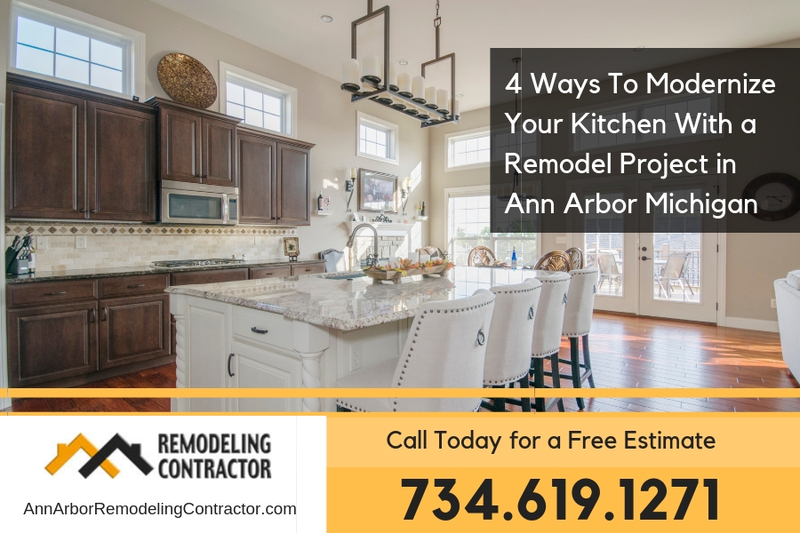 So to keep your home looking and functioning as a modern home should, here are a few ways to remodel your kitchen in Ann Arbor Michigan. Whenever you decide to get a home remodel project done it’s always best to consider the qualifications needed to complete the project. A small remodel project where you may have a new door installed or painted may be done by the home owner. However, for a more complicated project such as a kitchen or bathroom remodel a qualified contractor is needed. Kitchens and bathrooms both have specialized electrical circuits and plumbing that needs to be done by properly qualified professionals in order to pass inspections. Don’t take chances by attempting this home improvement project by yourself. Always use a fully licensed and qualified professional home improvement contractor in Ann Arbor Michigan for your kitchen remodel project. Because your kitchen it used so much it is important to have a flooring that will be able to handle everything you throw at it. With spills and scratches from dropped items and wear from standing and walking in the kitchen, you need something that is both durable and easy to clean. You also want something that will look modern rather than dated and out of place. So it is crucial that you pick the right material for your flooring that can withstand the everyday challenges you throw at it. Materials like linoleum or vinyl are cheaper options that will do the job, but for anyone who spends a lot of time in their kitchen or have a lot of traffic moving through it on a daily basis, it is recommended that you upgrade to a higher grade material like stone, wood or tile. This will be far more durable for your kitchen and will provide a more natural look that withstands the test of time and keep your home looking modern and fresh. It is a high priority for most homeowners to have energy efficient appliances to both help the environment and reduce your monthly expenses. Because it is a high priority of so many owners to have energy efficient appliances, the companies making them are always trying to improve their products to be the most energy efficient and appealing. So with all the new advancements in technology and design of these appliances, it is important to update your appliances to make sure you are getting the best possible product and the most savings. So if your appliances are older models that need to be replaced, or you think you can get better savings with newer models on the market, it is worth investing in upgrading your appliances. It is becoming increasing more and more popular to install and utilize voice activated lighting and sound technology in your home. This is especially useful in the kitchen when you have your hands busy with cleaning dishes, cooking or putting things away. This can not only control the lights in your kitchen, but timers, get recipes and even play music, simply by speaking to the technology. While it is hands down the largest and most costly of the kitchen remodels, changing the layout of your kitchen is both a great way to increase your home’s value and improve your ability to efficiently move around your kitchen. You can choose to go with the current trends to increase your home’s value if you want to sell your home, or go with a design that accommodates your specific needs to get the most out of your kitchen and be more effective your style. As I mentioned above you’ll need to have a fully licensed and qualified contractor to carry out the project. 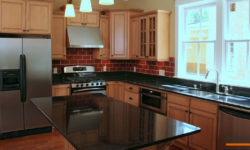 At Ann Arbor Remodeling Contractor, they offer free estimates on home improvement projects. Call them today at (734) 619-1271 to get started and to get a free quote on your home improvement project in Ann Arbor Michigan.